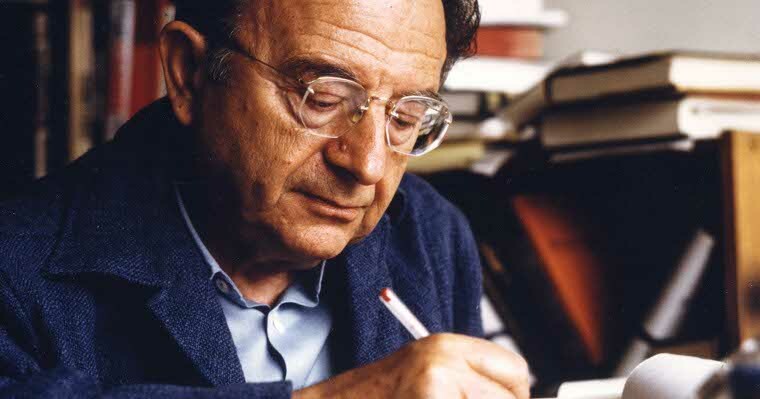 Here you can listen to a selection of audio clips with the original voice of Erich Fromm. Hier finden Sie einige Audioausschnitte mit der Originalstimme von Erich Fromm. Source: Lecture given in 1965 in Los Angeles. Copyright © 1965 by Erich Fromm; Copyright © 2012 by The Literary Estate of Erich Fromm. E-mail: fromm-estate[at-symbol]fromm-online.com. Verbatim transcript: Only to give you an example what is meant by self-activity. The person who is interested, who is ‘in the world’, the person who responds to the world, the person who is ‘in it’ and not the person who is separated from the world by being here and having the world as his object. Perhaps I could give one other example, assuming there is a swimming pool over there. Now, I can say here standing here, there is a swimming pool, there is a water of a swimming pool. But, if I jump into the water and then I talk about the water, then it is not anymore the ‘water over there’, it’s true I’m not the water, but I’m also not not the water, I am part of it, I am in it – to be interested comes from inter-esse, from ‘being in it’ – I am wet with it. It is not anymore an object opposite to me, but it is the medium in which I am. Now, that does not only hold true for a swimming pool, it holds true for persons: how much do I respond to another person, how much do I really see or how much do I really only think. Most of our feelings and experiences – if you think about it – you might describe rarely as thoughts about feelings rather than feelings. I guess there are many people who feel exactly the same, whether they are at a funeral or at a wedding, namely nothing, although their facial expression is very different, and they think they feel sadness or joy. Well, it looks almost like the same subjectively, and yet if you try to study it you might find how great the difference is between having a real feeling, which is a response to the world, and having a thought about a feeling. Source: Interview given to Studs Terkel in 1963. Copyright © 1963 by Erich Fromm; Copyright © 2012 by The Literary Estate of Erich Fromm. E-mail: fromm-estate[at-symbol]fromm-online.com. Verbatim transcript: Nationalism in itself is a mixture of three factors: (1) The sentiment of unity, of people speaking the same language, of eating the same food, which is important, and, singing the same songs, which is important, too. There’s a sentiment of community among them. (2) The second factor of modern nationalism is the sovereign state, which tries to organize all people who belong to the same nation. And this sovereign state is closely related to the national economy, which also tries to achieve the optimum, or sometimes the maximum of wealth for that particular group. This development started maybe in the Renaissance, but it took its’ new impetus after the French Revolution, and it was characteristic for Europe until the First World War, and Wilson’s Fourteens Points with the emphasis that each nation should be independent and a state, even helped with its growth. But, since the First World War, and certainly, since the Second World War, this concept of nationalism now has spread all over the whole world. It’s the ideal for Asia, for Africa, for Latin America. Well, I would say that there are many good things about it. But, there are also many dangerous things about it, because it tends to idolize state sovereignty. The idol and the fetish of state sovereignty can become in our nuclear age one of the most dangerous things for the existence of mankind. So I would say, today nationalism has become a very dangerous thing. But, if I may add one more thing. Even nationalism is somewhat crazy, that same group narcissism has taken on other forms–the form of racial narcissism, on the one hand, and of political narcissism on the other. The free world versus the enslaved world, as we say. Or the equalitarian world as against the exploitist, imperialist world as the Russians say. But, actually, the mood is the same as which you find in the religious wars of the fifteen and sixteenth centuries. Source: On April 4, 1962, Fromm gave a lecture entitled „A New Humanism as a Condition for the One World“ in Sherwood Hall in La Jolla, California. The lecture existed as transcript of the tape as well as in manuscript form among his unpublished writings. – First published in English in: E. Fromm, On Being Human, ed. by Rainer Funk, New York (Continuum) 1994, pp. 61-79. Copyright © 1962 by Erich Fromm; Copyright © 1994 and 2012 by The Literary Estate of Erich Fromm. E-mail: fromm-estate[at-symbol]fromm-online.com. Published text: What is really our consciousness? Our consciousness is all those human experiences of which our particular society permits us to be aware. Usually, aside from very small individual differences, we are aware only of that which our language, our logic, and the taboos of our societies permit us to be aware. There is, you might say, something like a „social filter,“ and only those experiences that can pass through that social filter are the things we are aware of; they are our consciousness. And what is our unconscious? Our unconscious is humanity. Our unconscious is the universal man. Our unconscious is all that is human–the good and the bad–all that exists in everybody, minus that small sector which is conscious, which represents the experience, thinking, feeling of the culture that we are thrown into rather accidentally. Our unconscious is the total man, and hence the great significance of being in touch with our unconscious is not to discover our incestuous desires, or this, that, and the other (which may sometimes not be unimportant). The great importance of the Freudian discovery of the possibility of being in touch with our unconscious is, precisely, that if we are in touch with it, then we are in touch with humanity; then we are in touch with the total man in us; and then, indeed, there is no more stranger. Further, there is no more judging of others in the sense that we consider ourselves superior to them. If we are in touch with our unconscious, then, indeed, we experience ourselves as we experience everybody else. Indeed, we overcome that separation within ourselves in which we are aware only of that which is expressed in our particular tribe or culture, and we get in touch with that which we share with all humanity. Wortlaut des veröffentlichten Textes in E. Fromm, Über die Liebe zum Leben. Rundfunksendungen hg. von Hans Jürgen Schultz, München (Deutscher Taschenbuchverlag dtv 34706) 2011, S. 16. Der deprimierte Mensch fühlt in sich so etwas wie eine Leere, als ob er gelähmt sei, als ob ihm etwas fehle zur Aktivität, als ob er sich nicht recht bewegen könne in Ermangelung von etwas, das ihn bewegen würde. Wenn er dann etwas in sich aufnimmt, so mag das Gefühl der Leere, der Lähmung, der Schwächung für eine Weile von ihm weichen, und er spürt: ich bin doch wer, ich habe ja etwas, ich bin nicht nichts. Man füllt sich mit Dingen, um innere Leere zu verdrängen. Das ist der passive Mensch, der ahnt, dass er wenig ist und der diese Ahnung vergessen macht, indem er konsumiert und zum homo consumens wird. Wortlaut des veröffentlichten Textes in E. Fromm, Über die Liebe zum Leben. Rundfunksendungen hg. von Hans Jürgen Schultz, München (Deutscher Taschenbuchverlag dtv 34706) 2011, S. 24f. Langeweile ist eine der schlimmsten Foltern. Sie ist sehr modern und greift um sich. Der Mensch, der der Langeweile ausgeliefert ist, ohne sich gegen sie wehren zu können, fühlt sich wie ein schwer deprimierter Mensch. Warum merken die meisten Menschen nicht, was für ein Übel die Langeweile ist, was für ein Schmerz? Ich glaube, die Antwort auf diese Frage ist einfach: Wir produzieren heute viele Dinge, die man einnehmen kann und mit deren Hilfe man über die Langeweile hinwegkommt. Wortlaut des veröffentlichten Textes in E. Fromm, Über die Liebe zum Leben. Rundfunksendungen hg. von Hans Jürgen Schultz, München (Deutscher Taschenbuchverlag dtv 34706) 2011, S. 27. Ich glaube, der Mensch ist nur er selbst, wenn er sich äußert, wenn er die ihm innewohnenden eigenen Kräfte ausdrückt. Wenn das nicht geschieht, wenn er nur „hat“ und benützt, statt zu „sein“, dann verfällt er, dann wird er zum Ding, dann wird sein Leben sinnlos. Es wird zum Leiden. Die echte Freude liegt in der echten Aktivität, und echte Aktivität ist der Ausdruck, ist das Wachstum der menschlichen Kräfte. Wortlaut des veröffentlichten Textes in E. Fromm, Über die Liebe zum Leben. Rundfunksendungen hg. von Hans Jürgen Schultz, München (Deutscher Taschenbuchverlag dtv 34706) 2011, S. 41. Immerhin, es ist eine Tatsache, dass die Moral des Christentums oder des Judentums unvereinbar ist mit der Moral des Erfolgs, der Rücksichtslosigkeit, des Eigennutzes, des Nicht-Hergebens, des Nicht-Teilens. Darüber brauche ich nicht lange zu reden. Das weiß jeder von Ihnen, wenn er sich diese Frage stellt. Außerdem ist diese Doppelgleisigkeit oft genug beschrieben und kritisiert worden. Kurzum: Durch die im modernen Kapitalismus praktizierte „Ethik“ ist der Religion das andere Bein amputiert worden. Sie kann nicht mehr die Repräsentantin von Werten sein, da man ihr auch in dieser Funktion nicht mehr traut. So hat Gott abgedankt sowohl als Schöpfer der Welt wie auch als Verkünder der Werte der Nächstenliebe und der Überwindung der Gier. Wortlaut des veröffentlichten Textes in E. Fromm, Über die Liebe zum Leben. Rundfunksendungen hg. von Hans Jürgen Schultz, München (Deutscher Taschenbuchverlag dtv 34706) 2011, S. 50. Ist unser Ziel die Förderung von Produktion und Konsum? Oder ist das Ziel die Entfaltung und das Wachstum des Menschen? Meistens wird behauptet, das eine lasse sich vom anderen nicht trennen: Was gut ist für die Industrie, ist auch gut für den Menschen und umgekehrt. Das klingt wie eine schöne Idee von einer prästabilisierten Harmonie, ist aber in Wahrheit ein großer Schwindel. Es ist unschwer zu beweisen, dass vieles gut war für die Industrie, was schlecht für den Menschen war. Das ist ja heute unser Dilemma. Wenn wir weitermachen wie bisher, geht der Fortschritt auf Kosten des Menschen. Deswegen haben wir eine Entscheidung zu treffen. Wir haben, biblisch gesprochen, zu wählen zwischen Gott und dem Kaiser. Das hört sich sehr dramatisch an; wenn man aber ernsthaft über das Leben spricht, dann wird es dramatisch. Es geht mir im Moment nicht nur um die Frage nach Leben oder Tod, sondern um die Frage des zunehmenden Totseins oder Lebendigseins im Leben. Alles kommt darauf an, lebendiger, lebensvoller zu werden. Darüber täuschen sich die Menschen immer hinweg.